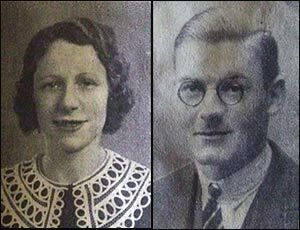 Many friends attended St. Mary's Rushden, yesterday for the wedding of Miss Gladys Lily Campion eldest daughter of Mr. and Mrs. W Campion “Ivy House,” Church-street to Mr. John Frank Kirkman eldest son of Mr. and Mrs. R Kirkman 29, Wellesley-road Margate. and a small veil-bearer in white. 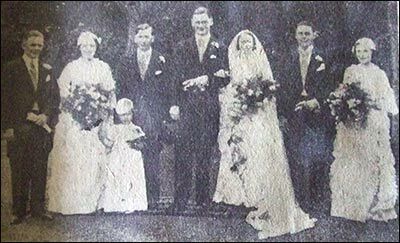 The bride was given away by her brother, Mr. R. A. Campion. She wore a white and silver lace gown with veil and sequin head-dress, and had pink roses for her bouquet. Her sisters, the Misses Dorothy and Rita Campion, attended the bride, and were attired in period gowns of mauve taffetta and net, with floral head-dresses. There was also little Miss Margaret Percival, holding the veil, and she was dressed in white, with flowered head-dress. The bridesmaids, carried posies of assorted sweet peas. They received from the bridegroom evening handbags which matched their dresses. Mr. Ronald Hawes of Margate was best man, and Mr Alfred Clarke, ARCO played for two hymns. The bride's mother wore a gown of beige lace, with hat and shoes to match. The reception was held at the Masonic Hall. A grey costume, with navy hat and shoes, was worn by the bride in travelling to London for the honeymoon. Mr. J. K. Kirkman is an accountant at Hitchin, and the couple's future address is "Cliffdene," West Hill, Hitchin. The bridegroom's gift to the bride was an enamel and silver brush set, and the bride-to-bridegroom present was a dressing case. The wedding cake was a present from the bride's maternal grandparents, and many other gifts were received. Messrs Wadsworth Bros., of Rushden, supplied the motors.